Sludgy Arizona band Horse Head have already disbanded by the time you hear their final release ‘Terminal’, and it feels like I’m getting to know them too late. Their follow up to the well received ‘Missionary’ will appeal to fans of EyeHateGod and Rwake, but Horse Head aren’t mere clones. In fact, they could’ve been something incredibly special. 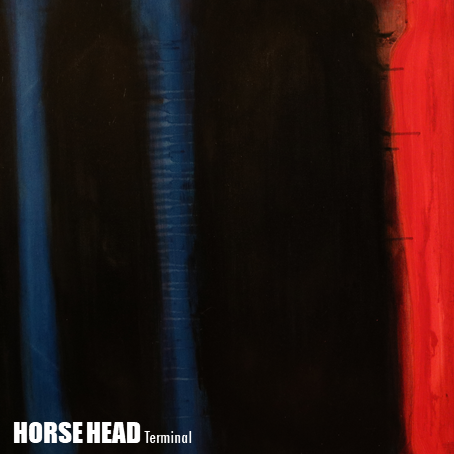 Horse Head have left quite the epitaph in ‘Terminal’. Sludgey, fire scorched riffs burn brilliantly under throat shredding screams and a dangerous sense of groove. It seems quite the shame that they have gone, but we have this to remember them by. Serpentrance have crawled from ancient Russian voids to belch forth their debut EP ‘The Besieged Sanctum’, first released in 2015, and now being rereleased by Blood Harvest Records. It’ll be out on the 10th November, and is probably one of the most devastating releases of 2017. Opener ‘Sin’ is a growling, lumbering beast of horrendous black/death metal; riffs hewn from the abyss crash upon you while a fell voice utters atrocities that wind around blasting drums and crawling riffs. This trade off between ferocity and slow doomy passages gives way to fears of what these rituals will draw forth, especially with that toll of the bell at the start of the frantic ‘The Aphotic Temple’. Serpentrance are indeed like their name; a snake like entity that moves with dark grace but waits with evil intent to snag you and entrance your mind. Hypnotic dirges leave you little light or air to survive on, and the titanic miasma of ‘Among the Timeless Tombs’ is the high point. ‘The Besieged Sanctum’ is a piece of art; devastating extremity layered with massive low end, brutal vocals and a vibrant yet crushing riff set that will strike fear into the hearts of men. Serpentrance are chaos, death and abyssal evil, and this release is the epitome of those principles. ‘Altar of Black Sludge’ couldn’t really be better named, as a morbid crawling riff oozes from underneath occult atmospheres of dread before the ‘Winged Beast of the Phantom Crypt’ envelopes a harsh riff in a suffocating miasma and unholy screams vomit forth from dark places. All the best parts of early Bathory combining with the latter swaying doom of Celtic Frost make ‘Gravemouth’ a modern, mutating classic. Sure, black metal plays the major influencing role here but there’s an undeniably sludge and doom undercurrent here too. The title track sounds like Xasthur covering EyeHateGod, which is inevitably awe inspiring. Monstrous, fetid crushers like ‘Evil in the Mire’ and ‘Swamp Ghoul’ raise foul spectres of southern sludge and when layered with a malevolent black metal spirit allows ‘Evocation of the Black Marsh’ to become as good an embodiment of a title as any album you’ve heard in ages. Poisonous, asphyxiating bands like Worm aren’t ten a penny, and therefore you need to find this. Serbian death metallers Ashen Epitaph have taken their name from a Benediction song, so you can expect some similarly brutal death metal coming from within ‘The Formed Filth Enigma’. This is their third full length, and is just out on Grom Records now. Think Amon Amarth without the Vikings and adding more death metal, and you’ve got a good idea of where Ashen Epitaph are coming from. A gloomy intro leads into the snarling ‘Fog, Mud, Loneliness’, a galloping riff laden beast with a ragged, poisonous guitar tone and a firm grasp of memorable riffs. There’s plenty of moments that remind you of Sweden’s greatest melodeath bands, from Amon Amarth to Arch Enemy to further back early Dark Tranquility or In Flames. ‘The Mirrorgallery’ has this feeling in spades, where thrashing death metal crunches through open melodic territory, dragging bloodied corpses behind. For me though, the overriding joy of this record is how, despite the obvious melodic tendencies, the purity of brutal death metal riffing, growling and blasting drums is never lost. The devastating ‘The Wounds’, the chugging ‘Destroy All False Faiths’ or the brutal smash of ‘One More Nail’ keeps this record fully grounded in filthy, rampaging death metal. Ashen Epitaph have created a record to be proud of here; visceral, relentless and thoroughly enjoyable. By looking at the cover, you’d expect Prostitution’s ‘Egyptian Blue’ to be a prog rock opus of epic proportions. But no, these New Yorkers are some vicious black metallers and this is their latest EP, coming on the heels of 2013’s ‘Listless’. Their sound spreads from Darkthrone to Pink Floyd, and their psychedelic aesthetic jars with standard black metal themes, but damn it if it doesn’t work out pretty well. Opening track ‘Hypergiant’ is a sprawling, raging monster of a track; all shrieking tremolo and bloodcurdling screams at the start before it begins to evolve, slowly and deliberately into something grander. While always retaining their metal heart (blastbeats reign supreme over much of this EP), the expansive nature of their riffing brings to mind latter period Enslaved, particularly ‘Ruun’, and the soaring ‘The Boat’ melds spiralling fretwork into spacious waves of black metal fury. Closing with the tour de force of ‘Elevated Droves’, where blastbeats disappear into dense voids of chugging riffing, and atonal melodies haunt plains of progressive metal, ‘Egyptian Blue’ is a thrilling and adventurous piece of extreme metal. Black metal is the core, but like bands like Ihsahn or Ved Buens Ende it isn’t the cage. Prostitution are a stunning proposition.